The company awarded a fourth round of transfers to HNL with a report date of June 1st. Here are the latest awards and acceptances. We will find out how many of the April 22nd awards have accepted on Tuesday, April 30th. * Seniority of those that accepted. The Spring 2019 Regular Meeting of the United Master Executive Council (MEC) concluded on April 18th, 2019. In addition to conducting the regular business of the MEC meeting, our MEC Grievance, Central Schedule and Employee Assistance/ Professional Standards Committees presented their annual Committee updates to the United Master Executive Council. You may read the daily summaries below. Elections were held for several positions on MEC Committees including the Negotiating Committee. Candidate’s credentials were reviewed, and interviews were conducted with those present. We would like to congratulate the following individuals who were elected to MEC Committee positions. We had planned to conduct reserve training April 25th in the HNLSW domicile from 11:00-1:00. No one attended our last training. 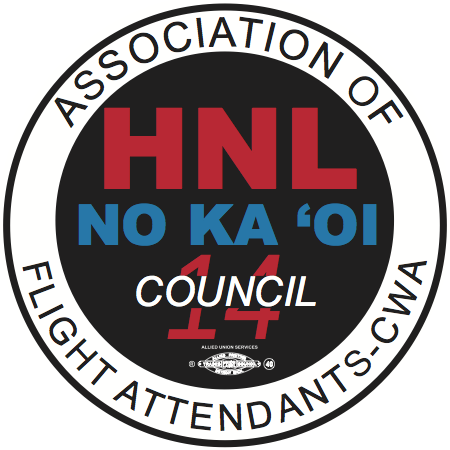 Please let me know if you plan to attend, otherwise I will reschedule the training for late May for the next group transferring to HNL with a June 1st report date. Since many of those transferring into HNL are on reserve for the first time under our JCBA, I wanted to share some Reserve resources. The Reserve page on the unitedafa.org website is dedicated to Reserve issues. The Reserve Guide and other Reference Guides are helpful in explaining provisions in the JCBA. These Guides are found in your Link (One United app) and on Flying Together. It can be helpful to download these documents to your personal smart phone or tablet utilizing apps like iBooks or PDF Expert. You may then use the keyword search function to find answers quickly. We encourage all Flight Attendants to subscribe to E-lines, our United AFA twice-weekly publication for United Flight Attendants. I mentioned in a previous Coconut Wireless that we should be receiving crew meals on our deadhead flights to and from ORD to attend Backstage. When you board, ask the crew if your meals are onboard. Please let me know if your meal is not boarded. Social Media Reminder- Be Aware!